London. 15th birthday was at The Hoist (South Lambeth Road, Vauxhall, SW8) on Saturday 24th March. By an innocuous entrance on South Lambeth Road ,illuminated with subtle blue lighting on the night and gives way to a warren of tunnels, arches, nooks, crannies and industrial metal mazes . It’s a virtual playground for horny homosexuals. And it celebrates its monumental 15th birthday! . The london fetish scene is one of the best in the world. Over the past 15 years it constantly updated the club and made it bigger and better for the visitors . They started out in one arch but now the have two arches. 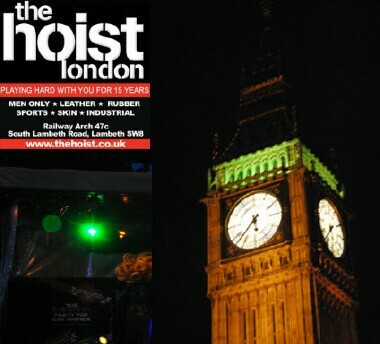 The Hoist 15th birthday was the biggest and best fetish party that London had seen. Expect a capacity crowd , &#64258;oor shows and a new layout of our famous cruise mezzanine. They all mix together and create an amazing, testosterone fuelled buzz that is unique in the world ,which happens to kick off every Sunday from 2pm in the afternoon at The Hoist.